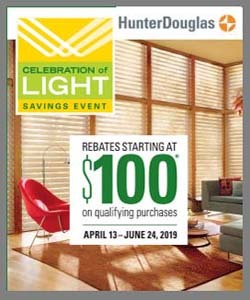 Just as the name implies, this new innovation from Hunter Douglas will trap light and keep it from entering a room, giving you total room darkness. If you’re not getting the sleep you need, one reason might be that your room is too light—so why not look in to new window shades paired with this fantastic system? At Bretz Interiors serving the greater Denver area, we’ll be more than happy to show you this remarkable innovation up close and in person. Contact one of our representatives today! This new system—a set of U-shaped side channels that overlap the front and back of the shades—is designed to work with Duette Honeycomb Shades from Hunter Douglas. If you’re in the market for honeycomb shades, you should definitely consider LightLock™. You’ll get the benefits of Duette paired with total room darkness! Duette offers a wide selection of fabric colors—over 200 choices! It can cover specialty shaped windows such as arches, octagons, trapezoids, and more. It can cover large windows, up to 12 by 12. It is highly energy-efficient and helps protect rooms from harmful UV rays.